The present study uses modern Moliere criticism as a way of understanding Mme de Sevigne. In both Moliere and Mme de Sevigne there is evidence of esprit or wit, that intellectual facility which perceives contrasts. Molieresque critical theory would call this perception the "e;Imposteur"e; technique. As the opening lines of Moliere's Lettre sur l'Imposteur propose, it is a "e;discours d… u ridicule"e; where ridicule is defined as the incongruous and the unreasonable. This notion depends on an act of intelligent judgement of what actually constitutes the normatively reasonable, and consequently, it presupposes the same perspective on the part of the reader/spectator. Implicit to both irony and ridicule is the complementarity necessary between the giver and the receiver of the message. 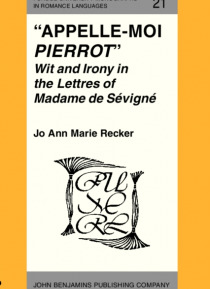 The application of molieresque critical theory to the Correspondance of Mme de Sevigne can contribute to a renewed appreciation of the highly intellectual quality of the comic genius of a "e;spirituelle marquise,"e; a mother who desperately wanted to entice a distanced daughter to regularity in an epistolary exchange, a woman of wit and irony.